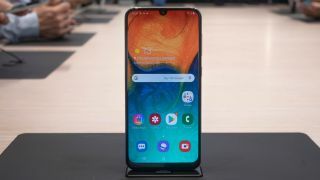 However, the South Korean firm has already quietly announced a handful of new mid-range handsets, with the Galaxy A10, Galaxy A30 and Galaxy A50 appearing at MWC 2019. As you can see in the invite sent to TechRadar below, it looks like there will be three new smartphones launched at the event, with the text 'A Galaxy Event' hinting that these are indeed A-series handsets. This event may just be the official European launch for the A10, A30 and A50, but there are also rumors of a Galaxy A60 and A40 circulating online, with the former apparently having a huge 6.7-inch display and three rear cameras. Interestingly however, there doesn't appear to be a notch or punch-hole on the screen outlines in the invite (the A10, A30 and A50 all have a notch) - suggesting we could see the first Samsung phones with an all-screen design. Zoom in and the background image does appear to be a little inconsistent in the top right corner, so there could be some form of notch or punch-hole - we'll have to wait and see. TechRadar will be reporting live from Milan, Italy on April 10 to bring you all the latest from the Galaxy Event.